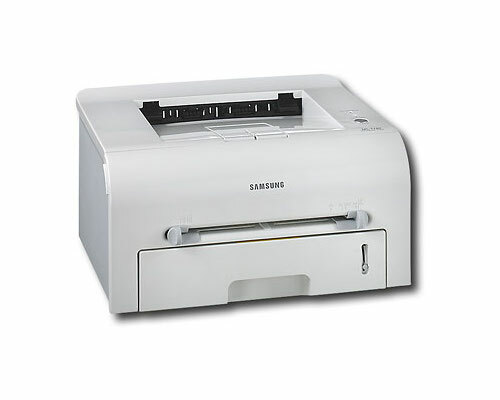 The Samsung ML-1740 is a home office laser printer suitable for personal and small-scale workgroup use and little else. It offers a small footprint and minimal features, typical with other consumer-grade laser printers designed to suit a handful of individuals' printing needs. The ML-1740 measures 13.7" by 14" by 7.6" and weighs 15.4 lbs, making it extremely small even compared to other consumer printers. It will fit on a desk alongside other computer equipment or virtually anywhere else with almost no trouble. This also makes the ML-1740 worth considering if your workspace is cramped, but requires a single-purpose printer. The ML-1740 produces 17 pages per minute in black and white to pages rated at Letter A size. It can also print to Legal, Executive, and Folio-sized paper, as well as custom-sized documents up to 8.5" by 14". It can print to envelopes sized International C6, International C5, Monarch, International B5, US No. 10, and International DL, as well as to transparencies, cards, plain paper, envelopes, and labels. The printer has a total capacity of 250 sheets, half a ream of paper, large by personal-use standards and very small by office/industry ratings. The printer produces documents at a resolution of 600 by 600 dpi, consistent with many other low-end consumer laser printers. It also includes 8 MB of RAM, which can not be upgraded. The ML-1740 includes an IEEE-1284 Parallel port and a USB 2.0 port for connectivity. No other options are available, meaning that the printer will need to be connected to an external print server with USB support or shared via printer sharing if you need to be able to print from multiple computers. The ML-1740 includes support for almost all Windows-based operating systems, as well as many flavors of Linux. Mac OS X support was unavailable at the time of the printer's release, but Samsung has since released drivers enabling OS X-based systems to print to it for every version up to the most recent, 10.6 Snow Leopard. DOS support does not presently exist. The printer includes no functionality for scanning, faxing, or copying, and none can be added to the printer. There are, in fact, no expandability options for the printer at all, meaning that whatever you purchase will be what you own for the foreseeable future. Additionally, this means that whatever desk space you save may be going to additional devices to fill those needs left unfulfilled by this printer. The ML-1740 produces a maximum of 17 pages per minute, under the industry standard of 20 pages per minute for monochrome laser printers (and well behind the 50-60 pages per minute offered by many newer systems) but perhaps comparable to or faster than many inkjet printers, though those systems will offer higher-resolution and better definition in their prints. Some operating systems, like DOS, will be unable to print to the ML-1740 because of the fact that it only supports SPL. If you often use non-Windows applications, it may be worth checking for their compatibility before purchasing this printer. 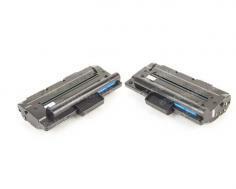 Some users complain that toner, after printing, smudges easily and prints very light early into the life cycle of a toner cartridge, requiring constant replacements in order to maintain print quality. Additionally, some users also report that Samsung does not carry low-end replacement components, requiring that the printer be thrown away rather than repaired, even when repairs would likely be inexpensive and extremely easy. Toner cartridges are often more than the cost of the printer, a symptom frequently seen on lower-quality consumer printers. Additionally, newer consumer laser printers can often print in higher resolutions of 1200 dpi and inkjets offer resolutions of over 5000 dpi, making them potentially desirable for users who need high-quality black and white prints. 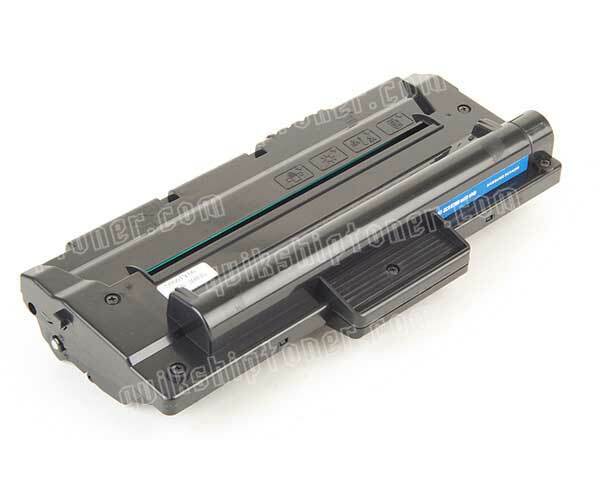 Review it: "Samsung ML-1740 "
The ML-1740 includes a low-capacity starter toner cartridge that will require replacement after approximately 500 sheets according to user reports. Replacement toner cartridges print 3000 pages at approximately 5% coverage, consistent with many other consumer-grade black laser printers. Like many lower-end printers, the drum unit is built into the toner cartridge, bringing down the amount of maintenance necessary to keep the printer running but bringing up long-term costs. ML-1740 (ML1740) 2Pack of Toner Cartridges - 3,000 Pages Ea.